Ross MacFarlane qualified in 1978 from University of Dundee and entered general practice in Scotland providing restorative care for both NHS and Private patients. After eight years he took up a position as Consultant in Primary Care Dentistry in the Armed Forces Hospital, Riyadh, Saudi Arabia. Ross undertook a Masters programme in Restorative Dentistry/Prosthodontics at University of Michigan and graduated in 1991. He returned to the UK and joined The Briars in 1992 as a prosthodontist Newbury. He gained the Membership in Restorative Dentistry, Royal College of Surgeons, England, in 1996 and was accepted onto the Specialist List in Prosthodontists 1999. He has developed referral services for complex restorative dentistry and prosthodontics and helped establish a private teaching course for general dentists and a study group for advanced prosthodontics for dentists. 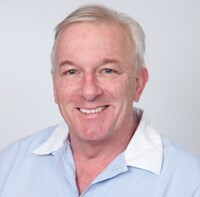 Prosthodontist Newbury, Ross MacFarlane is a member of British Dental Association, American Dental Society of London, British Prosthodontic Society, British Academy of Aesthetic Dentistry and Association of Dental Implantology. On a personal level Ross lives close to Newbury, his hobbies include skiing, scuba diving and mountain biking.